Hairstlye! : Which BANGLADESHI player has the best of them all? View Poll Results: Who has the best hairstyle? Hairstyle! 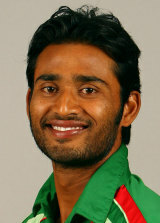 : Which BANGLADESHI player has the best of them all? Who has the best hairstyle of them all? Discuss. Last edited by Zeeshan; March 23, 2013 at 03:52 PM..
Ashraful. That's one good thing he has going for him. I liked Zia's buzz-cut today - very smart!